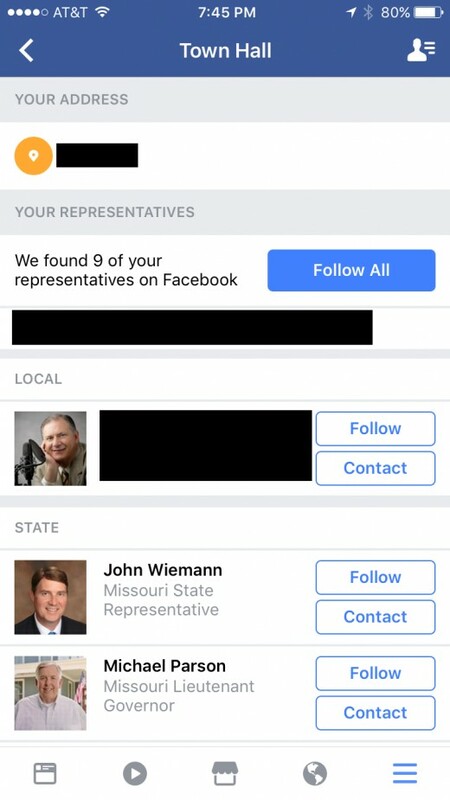 In March 2017, Facebook rolled out the Town Hall feature, which gives users quick visibility into all of the local, state, and federal representatives representing them, and makes it easy to follow them on Facebook, or contact through a variety of other means. The feature also makes it easy for users to enable reminders when local elections are coming up. 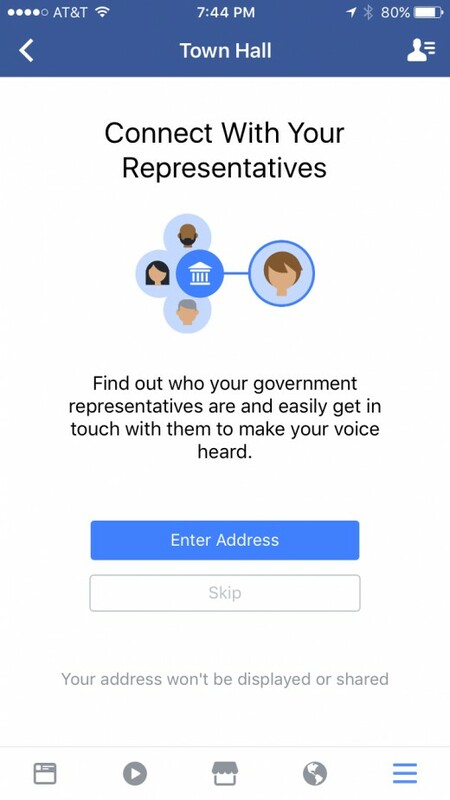 The intent of the Town Hall functionality is to give people more visibility into the political landscape as it affects them, and drive more people to get involved in participating in elections at all levels of government. 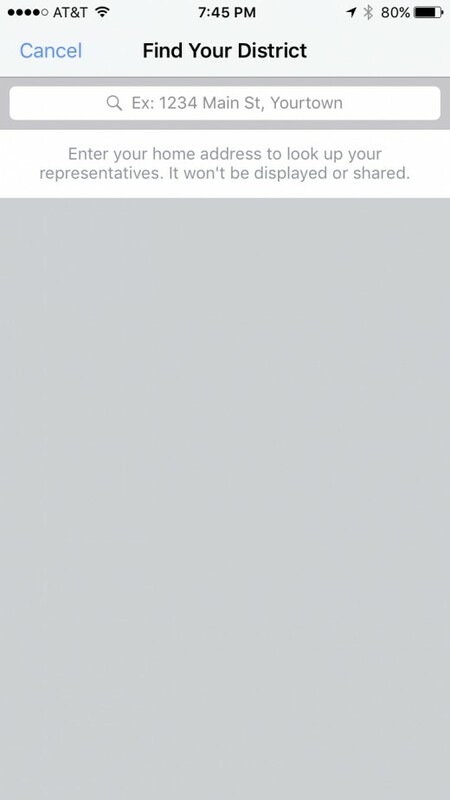 The Town Hall feature is accessible through the menu in the Facebook app. 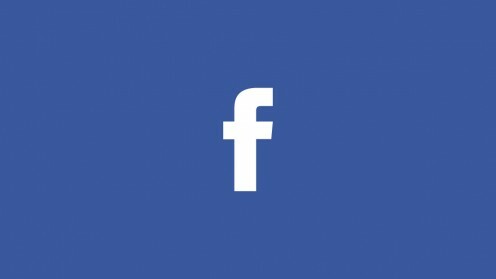 Open the Facebook app on your preferred device. Tap the "Menu" icon. The Menu icon features three horizontal lines and is in the lower-right corner of the screen. The Menu screen opens. Tap "Town Hall." The Find Your District window appears. Enter your address or your ZIP code, and then tap the blue "Search" button in the lower right corner. A list of results appears directly beneath the search box. Tap the result most closely associated with your location. The Town Hall screen opens. A list of all local, state, and federal representatives appears. The representatives are broken out into Local, State, and Federal sections, and also feature a picture and their title on the left. Tapping the address at the top of the results page will take you back to the Find Your District screen, where you can enter a new address and potentially receive a new list of representatives based on that address. Alternatively, if you choose to skip entering your address on the first screen, you can still navigate to a results page that will list representatives, but they will start at the state level, and not at the local level. Not all representatives will have all types of contact information. Some may only have a phone contact, and so on. 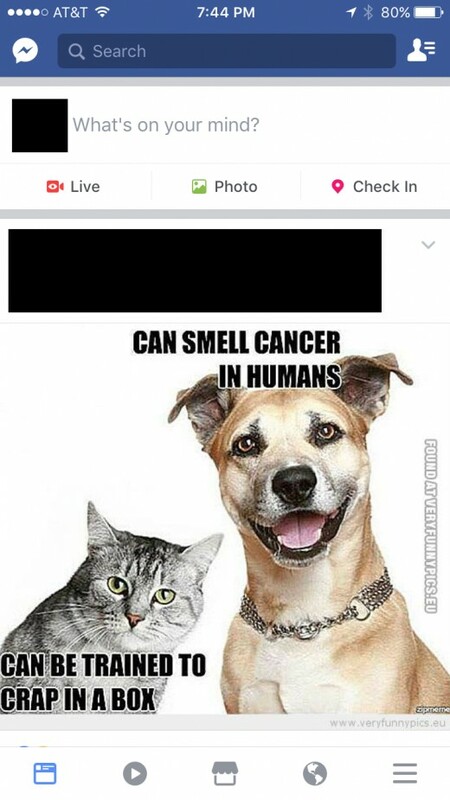 Additionally, the message and visit page options only to send a Facebook message or view a Facebook page; those links don't call out to or allow you to use non-Facebook functionality. 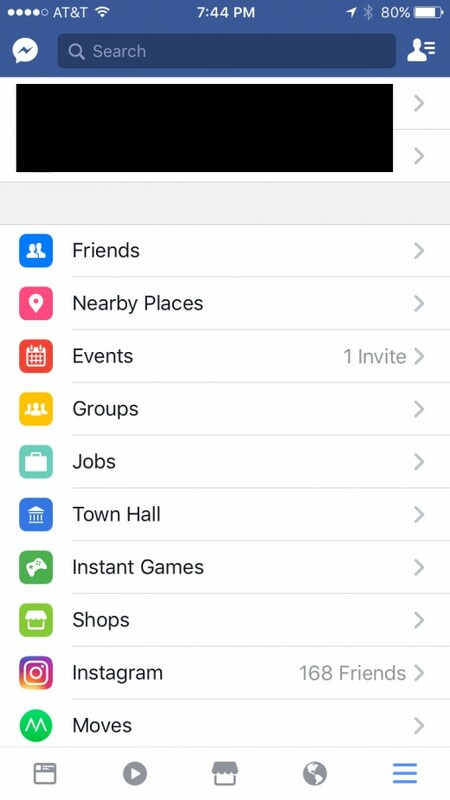 Navigate back to the Town Hall page in Facebook for your address. Choose the blue "Follow All" toward the top part of the screen if you want to follow all of the politicians. 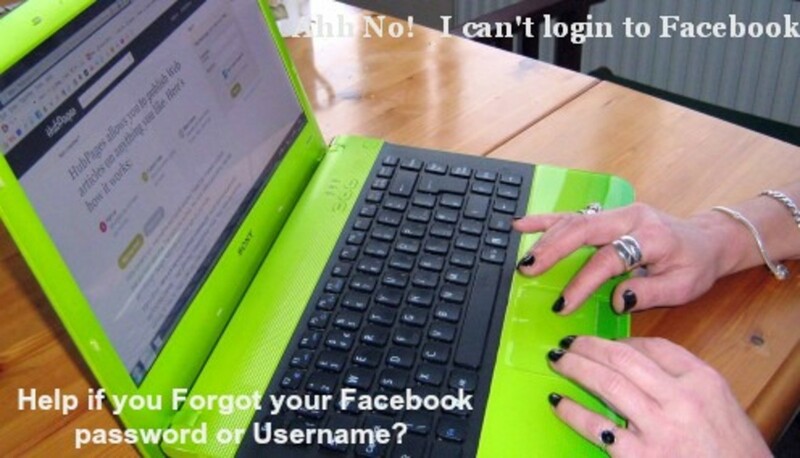 Alternatively, each politician will have Follow and Contact buttons to the right of their name. Tap "Follow" to the right of any individual politician's to follow them individually. 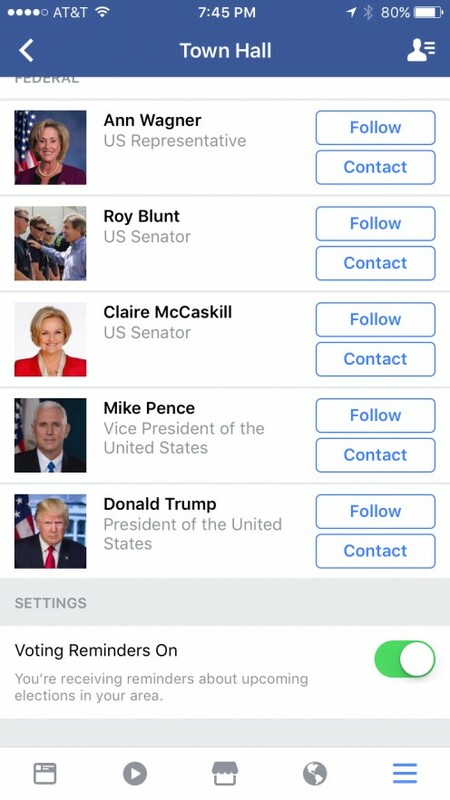 Tap "Contact" to the right of any individual politician's name to open a contact section that will fly up from the bottom of the screen. You will only see contact options the individual has set up, but a full list will include Call, Message, Email, and Visit Page. 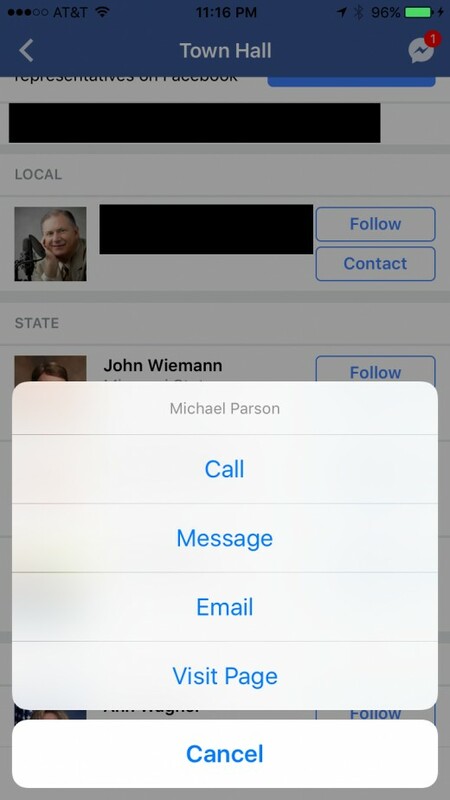 Choosing Call lets you dial that person's phone number, choosing Message lets you send that person a Facebook message, tapping Email will open a new message in the Mail app and load that person's email address, and tapping Visit Page takes you to that person's Facebook page. Navigate back to the Town Hall screen for your particular area. Scroll down to the Settings section at the bottom of the screen. Set the Voting Reminders On toggle to "On." This will ensure that Facebook will send you alerts whenever there is an election coming up in your area. 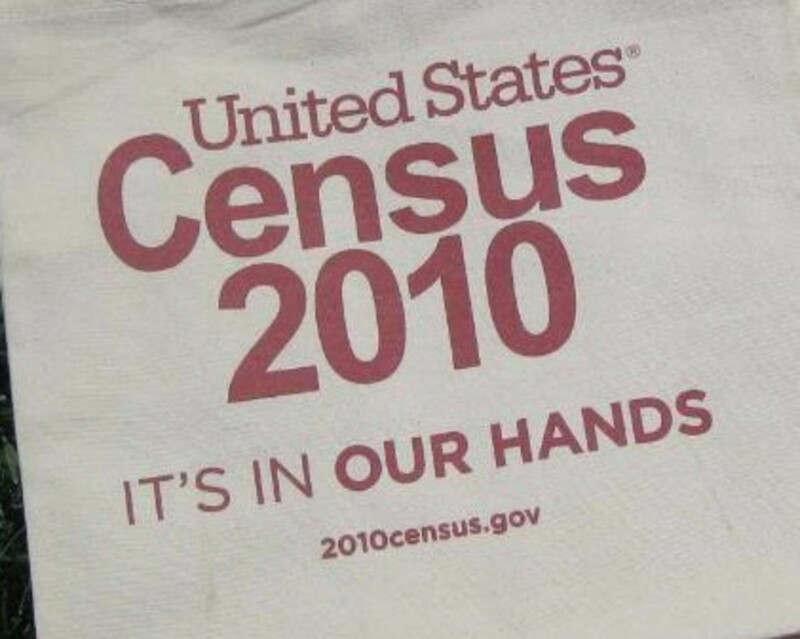 Do You Know What Your Local Government is Doing?